Careful attention to quality, and decades of proven performance in harsh shopping cart environments, are why Pemco’s PolyKat casters and wheels are considered to be a standard in the industry. 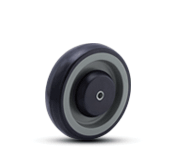 The PolyKat wheel features a polyurethane tread mechanically locked to a polypropylene core. This design helps prevent tread separation. 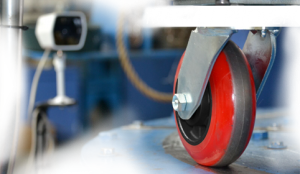 PolyKat wheels are famous for their outstanding wear characteristics and floor protection. These wheels resist most chemicals, solvents, acids, and oils. 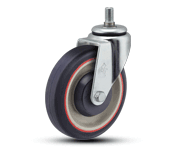 A rounded tread provides better roll-ability and maneuverability compared to other wheels. 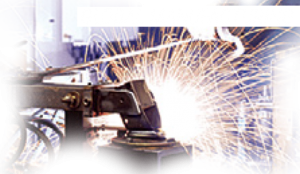 Polykat wheels features a polyurethane tread mechanically locked to a polypropylene core, which helps prevent tread separation. Famous for outstanding wear characteristics and floor protection, these wheels resist most chemicals, solvents, acids and oils. 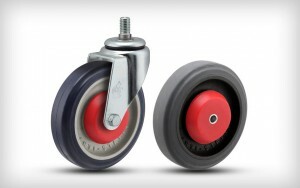 The rounded tread provides better rollability an maneuverability compared to other wheels. Pemco’s Dual Precision Bearing comes standard in the PolyKat 5″ Dark Blue/Grey and Dark Grey/Black models. 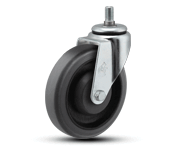 The Dual Precision Bearing allows for smooth, quiet rolling. 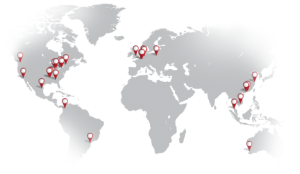 This bearing is pressed into the hub for greatly durability and longer service life. 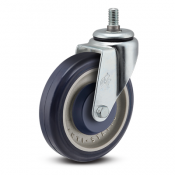 Our Single Spindle Bearing is standard on the Poly 4″ Dark Blue/Grey model, along with PolyKat variant models: Anti-Static, Tensioner, Adjustable Tensioner, and Fusion. 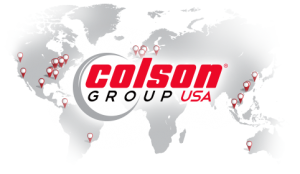 Insert-molded into the polypropylene core, this bearing is a single spindle design that cannot become misaligned with use. It is sealed on both sides after being pre-lubricated with high quality grease. Shoppers don’t want to be zapped by static electricity. 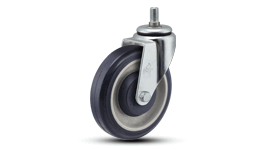 Anti-Static Casters and Wheels solve that problem. Tensioner wheels help reduce damage caused by rolling, unattended shopping carts. Adjustable Tensioner wheels allow you to set the self-decelerating liability protection for your parking lot conditions. 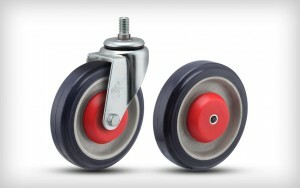 These wheels offer the fusion of our anti-static and tensioner wheels for the ultimate shopper comfort and protection. This caster will reduce the occurrence of flutter or shimmy commonly found on many of today’s shopping carts.